D.L. Menard, whose song "The Back Door" is among the most popular in Cajun music, is dead at the age of 85. Louisiana Funeral Services and Crematory in Broussard said on its website that Menard died Thursday at his home in Scott, Louisiana. Including covers by other artists, the song sold more than 1 million copies, according to Floyd Solieau, whose Swallow Record Co. released the song as a single in July 1962. The song is a jaunty ditty about a man who gets so drunk he sneaks into his house through the back door. Menard wrote "The Back Door" in French, using English phonics -- he grew up speaking Cajun French, but teachers then would paddle children for speaking the dialect at school. The title in French was "La Porte en Arriere." 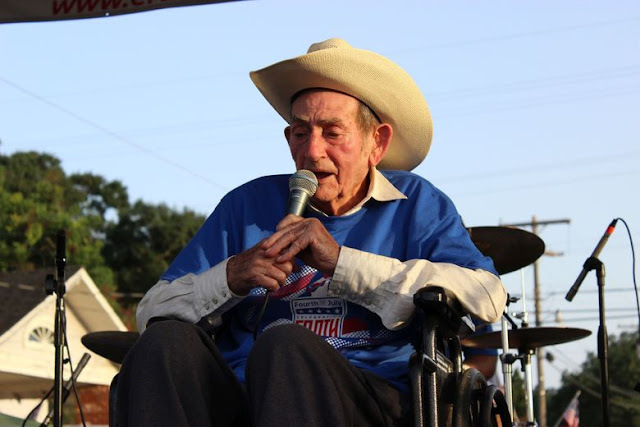 Menard's last public performance was July 2 at a tribute his hometown of Erath put on for the 55th anniversary of "The Back Door." Though he had to be helped across the stage and he performed from a wheelchair, he sang "The Back Door" and many other songs, his voice still firm and strong. The song helped make him a goodwill ambassador for Cajun music and culture, traveling to dozens of countries on State Department tours. Menard is in the Louisiana Music Hall of Fame and the Cajun Music Hall of Fame, and in 1994 he was named a national heritage fellow by the National Endowment for the Arts. The funeral home said Menard's funeral will be Monday afternoon at Family Life Church in Lafayette, with visitation there Sunday and Monday morning.